Iceberg lettuce does not get much love on food blogs or in restaurants. It is not too surprising since there is not a lot of nutritional value, or flavor. When I make a salad I usually go for spinach, arugula, or field greens. That being said, there are some recipes that absolutely require iceberg lettuce. One of those is the classic wedge salad. 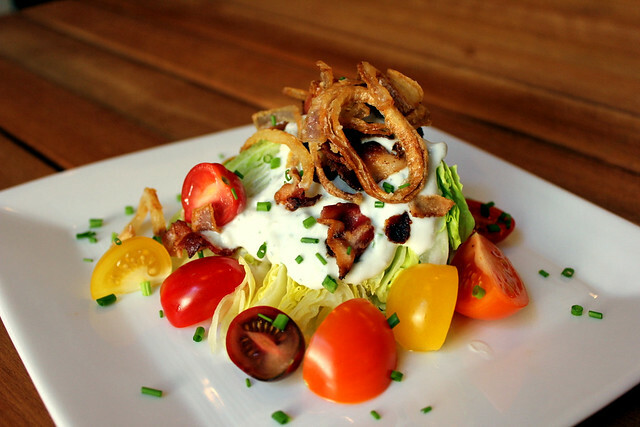 How can you go wrong with a wedge salad? This popular steakhouse dish usually consists of a crisp wedge of iceberg lettuce, bacon, tomatoes, and blue cheese dressing. All good things. I kept my version pretty traditional but included fried shallots. I used multi-colored tomatoes to add some visual appeal. I decided to make a homemade blue cheese dressing with greek yogurt, buttermilk, and high quality blue cheese. The homemade dressing was tasty but I think the salad would be great with store-bought dressing. The Perfect Pairing for this tasty salad is the core removal technique I use on iceberg lettuce. Maybe everyone already knows this but this might be my favorite part about salad prep, so I had to share! Hold the head of iceberg in both hands with the core facing the counter. Bang the core directly onto the counter with a good amount of force. This releases the core from the rest of the lettuce so you can pull it right out! Now your lettuce is ready to be wedged. Can I use that as a verb? I just did. Fry bacon in a skillet until crispy. Drain on paper towels. Crumble and reserve. Add 1 inch of oil to a pan, heat over high heat (preferably on an outdoor burner). Toss the shallot rings with flour until coated. Once the oil is hot, add one shallot to test the temperature, it should start bubbling immediately. If the oil is hot, add the remaining shallots and fry until golden. Remove from the oil with a slotted spoon and transfer to a plate lined with paper towels. Season generously with salt while still warm. For the dressing, in a small bowl, add the blue cheese, yogurt, buttermilk, mayonnaise, and vinegars. Mix until combined. Stir in the sugar, salt, pepper, and chives. To serve, place a wedge of lettuce on the plate, top with tomatoes, crumbled bacon, blue cheese dressing, and crispy shallots.